There are times when the goodness (or the Greater Good in this case) just keeping on coming. More Tau rumor bits are filtering through our community, and when we keep on seeing this many hints, it just seems the puzzle pieces are all starting to add up. Does this mean I am on the April release wagon when it comes to a Tau codex? Well, I at least have one leg on the wagon, and one leg still on the ground. Of course that means that I am being dragged down the road. So here's to looking at a hopeful Tau codex Release sometime before I get hurt. 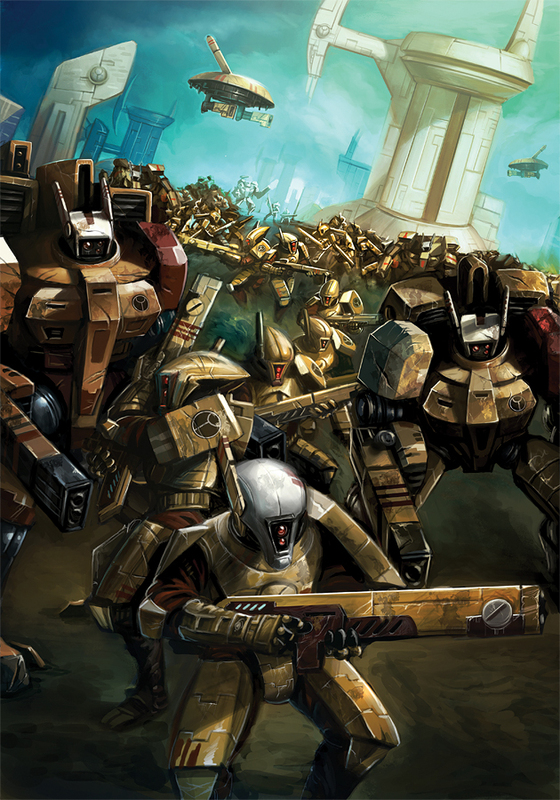 There was some later developments today about the release of Tau coming in June. These are listed below from shaso_iceborn. Its also worth mentioning as well that Hastings had predicted Tau in April as well. The owner of my local store told me yesterday that he was unable to get a copy of the current Tau codex to put on display. When he pushed he was told that he could not get one because there was none any more, he should wait until next month to order one that there should be plenty then. Could well be nothing but in reading through at least a couple of articles in this months White Dwarf, there are references to Staffers working on Tau forces. Jeremy's article starts with him working on a FW Battlesuit and later someone is mentioned to be working on a Tau force. Likely nothing, but are staffers getting their Tau forces moving prior to release... only time will tell. Today a friend of mine working in management for a hobby store received a call from his supplier asking for all tau hammerheads, broadsides, and codex to be pulled from the shelves and returned to gw. Note: I am a little confused on the dates between an April and June release on this bit (and I am not in email communication with Shaso to clarify). perhaps a 2nd wave in June. Tau will be released in June, along with a new Farsight model. New Kroot HQ, and the options Nafka mentioned above. His source on this one is very good. Are you guys ready for April and the lightened wallet the new Tau codex brings? 2 New Fliers, 2 new Suit options, a Uber-suit, New kroot HQ option, lots of new kits and better rules and options. Us Tau are about to finally get RETRIBUTION!!!! Sorry imperial players but I will be "lighting" you up here very soon. Going from rumors to more rumors to forum chatter Im hearing a whole lot more about an April release....rather than a June release, as it goes this is only the 2nd time iv seen reference to June while iv seen April more than half a dozen times so far..so fingers crossed on an April release! I remain a skeptic...not happening. Tho I hope I'm wrong. Reposting to avoid confusion, Tau will be released in April alongside a new Farsight model and new Kroot HQ.